Christine Bishop (left) discusses the work of the Centre County Youth Service Bureau with Town&Gown founder Mimi Barash Coppersmith at Faccia Luna. Bishop became involved with YSB 15 years ago as a parent educator, and then served as director of family services. Now, as director of operations, she is responsible for the day-to-day programs operated by YSB, and plays an integral role in strategic planning for the agency as a whole. Originally from Towanda, she was valedictorian of her high school class and graduated in 2002 from the University of Rochester in New York with a B.A. in psychology, and a minor in biology. She started her college education in chemistry, but quickly found her passion for social services while working as a research assistant at the Mt. Hope Family Center, which was affiliated with the University of Rochester. 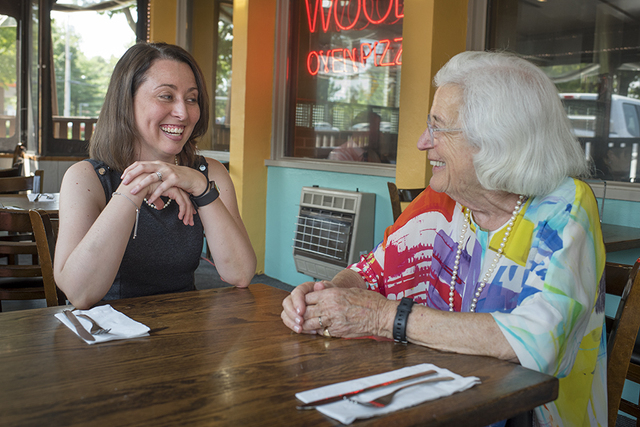 Town&Gown founder Mimi Barash Coppersmith sat down with Bishop at Faccia Luna to discuss the work that is being done by the Youth Service Bureau in Centre County and how different organizations in the community collaborate with YSB to help youth. Mimi: Well, Christine, nice to meet you. Mimi: I was fascinated in reading your resume that you majored in biology and psychology and you went to work in the nonprofit world? Christine: Yes. I actually started at the University of Rochester as a chemistry major and kind of found my way into psychology classes. The university had a family center. So, I kind of found my way into doing research there and just really loved the idea of helping people directly rather than working in lab. Mimi: When you engage in a job that helps people, even when it doesn’t work to your greatest expectations, you must have some kind of a human satisfaction for doing good work. Christine: Absolutely. I’m a firm believer in planting seeds and that a lot of times there’s value that we don’t always see right away, that long term, it can make a huge difference. You don’t always know how that’s going to play out, but if you help one person, you feel like you’ve done your job. Mimi: In a way, it’s God’s work. Let’s talk a little bit about the tough work that you do because you try to fix the attitudes and behavior of people who have their own way of living. What’s the greatest challenge to that? Christine: Well, what not everybody understands is all families have struggles and challenges. All people have struggles and challenges. Maybe somebody’s facing eviction or the loss of a job or a loved one, or dealing with a serious illness, that can put a tremendous amount of stress on a family. Part of our role is to be that safety net for kids in our community. It takes a village, so when people are struggling, if we can help keep kids’ needs as a priority than that’s what we need to do. Mimi: To what extent do you collaborate with other organizations that seem to have similar goals? Christine: Quite a bit, actually. We collaborate with the United Way, the YMCA, and the Women’s Resource Center (now Centre Safe). We all work to train people in the stewards of children training – to address child sexual abuse prevention. So, all of us put forth staff time, effort, and energy into learning how to facilitate those classes and making them free in the community. There are a lot of issues that affect kids and families that we all have a role in and when we can work together, that’s great. Christine: We, as adults in the community, have a job to protect our kids. The more that we can raise awareness, to train everybody about how to respond, the better we’ll do to try and protect everyone. Mimi: In the area of collaboration, are there cases where working between and among other nonprofits, we all gain from that cooperative effort? Christine: I see it in almost all of our programs. YSB has a good case management aspect to it. So, when we’re working with a child or a family, we’re really assessing that child’s needs, the whole family’s needs. And if there are instances where there’s a need we don’t provide, we’re very quick to refer to outside agencies. Christine: Assistance with housing. Women’s Resource Center. If there are domestic violence issues going on, we can refer people there. Those are the first two that come to mind. Mimi: Is this something that is a lot or just occasionally? Christine: When you work with people, people aren’t easily fit into a box, so it’s all of our responsibility to know what services are in the community and who specializes in what area. Mimi: There are a whole lot of instances now of opioids and heroin. To what extent are you dealing with that on a daily basis? Christine: We have a staff member who is very involved in the HOPE Initiative, which stands for Heroin and Opioid Prevention and Education. So, we do a lot of public education forums to help everybody bring awareness to the fact that there are prescription drop boxes in the community that we should be using. Mimi: Do we take this to the schools? Christine: We do. We have drug and alcohol prevention programming where we go into schools; we’re there for Red Ribbon Week. We do health classes to give students accurate information and awareness about the dangers that come along with drugs. Mimi: How do you judge your success? Christine: Anytime we see a child learning these skills or even see a family that is better able to handle the challenges that come their way, that’s success to me. Being able to put families and kids down a path where they’re successful. Mimi: How much do you connect with these people, these children that have successfully gone through your program? Is there a connection later that helps give you a true sense of accomplishment? Christine: Sometimes we do lose track of people, but oftentimes we’ll hear from kids who lived with us in our shelter or our group homes. We hear from kids that lived with us and call back when they get a job or get married, and have those life events. MImi: That’s gotta be the icing on the cake. Mimi: It all began because a man, a judge (R. Paul Campbell) who often presided over cases where children were accused of minor crime and he wondered if there was a better option than sending the children into the juvenile justice system. The Youth Service Bureau was his idea and he helped make it happen. That’s a story that needs to be told frequently. Christine: I love that part about our history because we really got started when people identified a need in our community and wanted to solve it locally. So, I’m proud that years later we’re still doing that. Mimi: And another person that had a big influence on the early days was Amos Goodall. Christine: Yes. We have the Amos Goodall Awards that we give out every year at our annual gathering. Mimi: Well, he’s a remarkable success story. Mimi: Your job has to have days that are downers and challenging beyond definition. How do you handle that when you’re the person in charge? Christine: That’s a great question. I think it all comes down to really believing that what we’re doing is good and worth it. Even when we see something that’s sad or have a hard day, we have to keep doing it. There are kids here that need us. So, we’re going to keep doing that, hopefully for 50 years to come or more. Mimi: So, what is your relationship with child and youth services at the county level? How does government collaborate with your organization? Do they complement one another and collaborate? I have this fear that we have grown so quickly in this area that we can’t keep up with ourselves. Christine: We have a really strong partnership with the county, especially the Office of Children and Youth Services. We contract with them, so we are able to create more manpower. We provide a lot of in-home care and education services, reunification services to kids. We’re glad to be part of meeting that need. Mimi: The problems that children have – to what extent is mental health a part of it? Christine: It’s definitely a big factor. I think it’s really important when you’re looking at any child to look at the whole child. We’re looking at their physical health, mental well-being, safety, and their opportunities. Do they have access to the things that we want all of our kids to have access to? We try really hard through our case management and different programs to make sure all those needs are being addressed. Mimi: What is your toughest area? What is your program that is the greatest challenge? Christine: They’re all so different. It's very hard to answer that question. I think sometimes our toughest work is also what we do best. We’re not just looking at one kid in isolation, we’re getting to know their whole family and whoever their supports are. So, that adds complications into the mix. But I think we do our best job when we’re looking holistically. Mimi: Do the families feel grateful for the Youth Service Bureau? Or do some of them resent it? Christine: Well, I hope they feel grateful that we’re able to be of assistance. One of my big philosophies is that parents are the experts in their own family and of their own children. And we have to respect that. We want to partner with them and come along beside them. We don’t want to come in and tell people to do things completely differently. We really want to help them through whatever those struggles are. Mimi: You deal with all kinds of issues—drugs, alcohol, behavior, what else? Christine: All of the above. I think another thing you didn’t list is trauma. Parents themselves oftentimes have been through a lot of tough experiences. They might have certain life circumstances that are really hard. Parenting, on top of that, which is already a really hard job, can be a lot. We try to be really sensitive about that. Mimi: How did you arrive at the point where this consumes you, but it thrills you at the same time? Christine: I think that happened for me back in college. When I was working at the family center; I worked in an after-school program and a summer camp program. I got to go visit [families] in their homes, help sign them up for camps, and do some research surveys with the parents. I had that moment of realizing that it’s not just about the kids that I see in a classroom. It’s about their whole family, and how family really has a huge influence over young kids. And we want to support those families. Mimi: How do you avoid getting frustrated when it doesn’t work? Christine: We try our best. Yes, there are going to be hard days, bad days, and days that we wish things went differently. But kids need us to be here doing this work. And so, we have to step up and do that. Mimi: The leaders of Youth Service Bureau have a history of long life with the organization; there’s not a lot of turnover. When you have this love in your heart for what you do that’s so difficult, what makes you that way? What is the motivation that has you do that at least five days a week, full-time? Christine: I think if you truly love this kind of work, you’re in it for the long haul. It’s very rewarding to see families feeling better about how they’re raising their children. Mimi: Does it make you a better parent? Christine: It does. I worked for about seven years as a parent educator before my daughter was born, so I had a lot of access to really great information and child development information. I think that really helps me as a parent. Mimi: Let’s talk a little more about all the problems related to heroin, opioids, and now marijuana, accessibility. What do you see as the biggest contemporary issue for youth? For troubled youth, in particular. Christine: The opioid epidemic is scary. All we can do to help is to teach kids about refusal skills and consequences because prevention is always so much more effective than intervening after a problem has started. When we can get in there early, when kids are young and haven’t gotten too far down that path, that’s going to be a lot more effective than trying to clean things up later. Mimi: Once they start down that path it gives the appearance that it’s very hard to get off that path, whether it’s alcohol or drugs. Christine: Prevention is always the best practice strategy. I’m really proud that we’re able to do some of that work. Mimi: Do you, at any point, get involved with the university and youth services? Christine: We do. That’s actually one of the areas I’m really excited about. Right now we’re partnering with Dr. Kate Guastaferro. She has some research that she has put into developing a curriculum for parents that addresses child sexual abuse. So, our clients that we serve, our families will now have access to that curriculum. Mimi: Well, I want to thank you for joining me for lunch and for giving all of us more information about a remarkable organization. Good luck as the chief executive officer. Christine: Thank you so much.